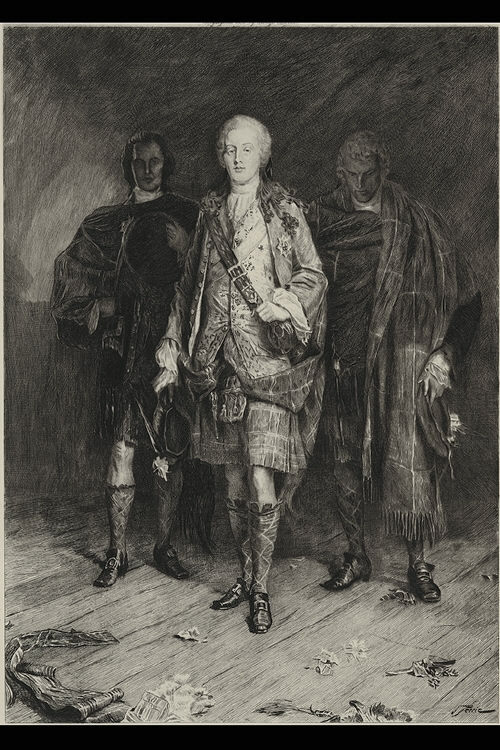 "In this painting, from the Royal Academy of 1892, Mr. Pettie undertakes to set before us, in some what formal fashion, the graces and attractions of the Young Pretender, who still lives in Scottish song and tradition as "Bonnie Prince Charlie." The handsomeness of person and affability of manner of this young prince have been recorded by all the historians. In the painter's presentation he comes forward, rather stiffly, as if to the footlights, followed by two attendants in dark green plaids. His own costume is very picturesque, of white satin and red tartan, and his pale face is surmounted by a powdered wig. Through his father, the Chevalier St. George, he inherited the claim to the English throne from his grandfather, James II., and his own attempt to make good this claim by force of arms was ended by the bloody battle of Culloden in 1746. The mother of Charles was Clementina Sobieski, granddaughter of the celebrated monarch, John Sobieski, and one of the wealthiest heiresses in Europe."